An umpire who was suspended as part of a betting investigation worked at last year's US Open, the United States Tennis Association (USTA) confirmed. Croatia's Denis Pitner was banned for a year in August after passing on details about a player's fitness and accessing an account used to place bets. Pitner was approved by the US Open on 13 July and picked up his credential before the USTA was notified of a ban. The USTA responded on Friday, blaming "a flaw in our process". After the Guardian newspaper revealed that Pitner had officiated while banned, a USTA statement said: "After learning within the last 24 hours that an official on the 'Do Not Credential' list may have worked at the 2015 US Open as a linesman, the USTA immediately investigated the claim. "The USTA was shocked to find that this was in fact the case." 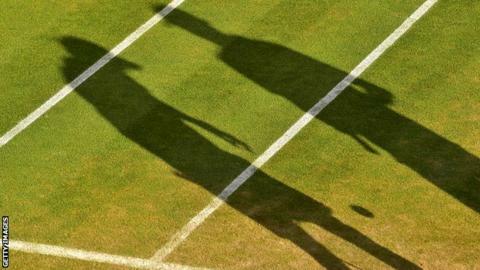 Last month, the BBC and Buzzfeed exposed evidence of widespread suspected match-fixing in tennis. The sport's governing bodies announced on Friday that an independent review panel will take at least a year to investigate allegations of corruption in tennis. Pitner also officiated at January's ATP Qatar Open at Doha, and the USTA vowed to work with the review panel to prevent any recurrence. "We take this matter extremely seriously and make the investigation of what caused the error its highest priority."